After getting inspired from Neo, I have started a bit of JS learning these days. Whenever I learn something I will try to post it here(as of now my learning is NOT exactly bookish where I am going chapter by chapter etc, it could be more like small-small project vice kind of), I would like to request you all to correct me if I am wrong somewhere, any improvements or discussions are welcome. GOAL of this post(creation of a simple UI): For basic learning I have gone for my college project where I had created almost 10 years back a "Student registration form", I tried to build it here. UI's goal is to get information from new students who are willing to join any college and if any detail is missing it should alert student, once all details are done it should show as a message to Student(Keeping it simple as of now). 1- Download Visual studio code software from net first. 2- Now install an extension named "Live server:" in it. 3- Now create a folder your machine, in my case I had created "js learning". 4- Use open folder option in Visual code studio and select newly created folder there. 5- Now create your html and js files(mentioned in further description) in same folder in Visual studio code. Coding part comes now: Before we start coding I would like to mention(which most of the people know), html is a markup language in which for doing dynamic kind of stuff we need scripting language where JS comes. So we will be creating UI in html and then data fields validation parts we will handle by JS. <table cellpadding="2" width="100%" bgcolor="#ADD8E6" align="center"
I believe most of the people have read html so I will only touch upon its functions. Either we could write a different js file with js code and call it here in <script type> here or we could write JS code in here itself, I am taking first approach keeping JS file separate and calling it in HTML file. <table> as Name suggests table tag is for creation of table on UI. <form>,is to create forms on UI. <tr>, is for inserting a line in Table. <td>, is for inserting a cell in line of table, it should be always in <tr>. input type, will define which kind of input type we have on UI eg--> text box, radio button, drop down menu etc etc. 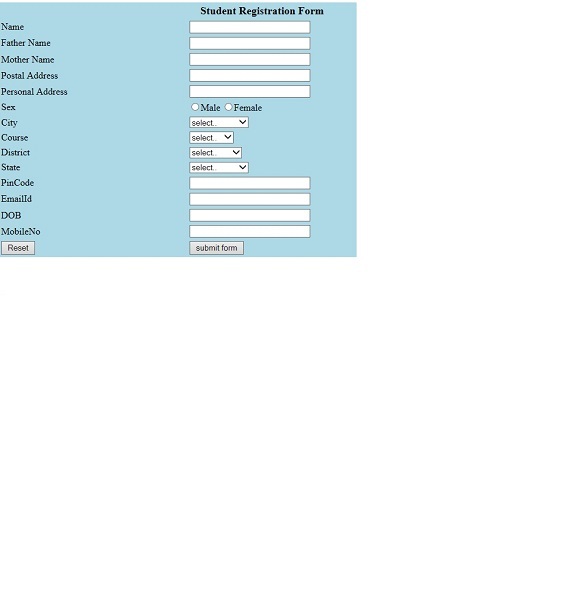 4- Basically we have created a form and inside it created a table with few rows and columns which will have text boxes, radio buttons etc to gather details from user who is using UI. Now comes the JS part: HTML will create UI for us but it can not validate data for us, for that purpose I have created a js file which will make sure user is NOT leaving any field empty. //This is a js function to validate all the functions of UI. 1- Created a function in js named validate, which will be called on submit button hit(though I have not completed it yet). 2- Mainly checking conditions that each field should have values. Using alert to get a message for user to fill that field. Above statement .focus takes cursor to the mentioned field so user need NOT to move cursor/mouse to missing field. Like that I have done for all fields. Any suggestions are welcome, I will post more learning here. PS: Off course lot of googling I did for this very first post, references were taken(few links mentioned in post) and from roseindia site(I did make some changes in js and html parts). Last edited by RavinderSingh13; 3 Days Ago at 12:28 PM..
Bottom Line: I would never do this kind of JS web development in Eclipse, Ravinder. I would never do this kind of development in Eclipse, Ravinder. Thanks Neo for suggestions, I have installed "Visual studio code" now and have run code there, changed prerequisites instructions in my post too. Welcome to 2019 web dev, Ravinder. This will serve you very well when you move pass the JS, HTML and CSS basics and move on to node.js and vue.js and other useful JS libs (and SASS) as you become more creative. I learnt today, how to create a button in HTML, how to present OK or CANCEL button for user and after user's selection how to print date and time on screen. txt = "Sorry !! since you pressed CANCEL, so no date and time printing here :)"
1- HTML code mentions JS file named print_date.js in it in <script> TAG. 2- It also has a button with button tag, with is value(what it will be shown in text form on button and its id(how we will call it in further program)). 3- We have a <p id=get_date>..</p in our code for paragraph too. 4- Button has something called gettime() function which is called whenever a click happens on button by mentioning onclick="gettime"
5- Now comes JS part, we have a function in JS named "gettime" which will help us to present pop up window for user. 6- confirm("Press a button") condition shows a pop up with OK and CANCEL options in front of client/user. 7- If condition is TRUE when a user hits OK and will create date object's variable and save my locale machine's date and time in txt variable. 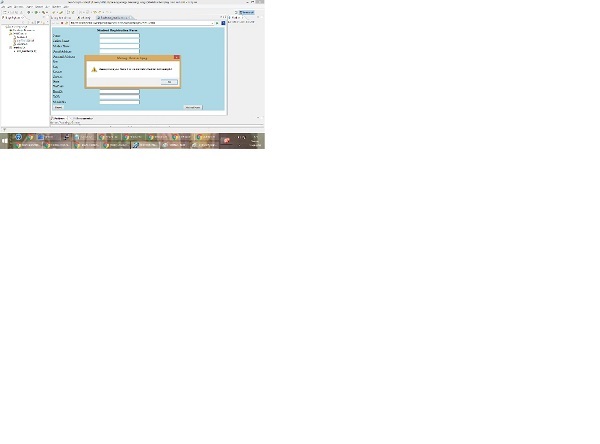 8- Else condition, means when user selected CANCEL option then assigning txt variable value as an error. 9- Now finally using document.getElementById("get_date").inneHTML toassign value of txt variable to p tag in HTML file. 10- Now HIT http://localhost:5000/my_html.html link in browser. I am very tired and almost sleeping so will add screen shots of this too tomorrow,see ya. Will try to add more small small learning here. However, you should try to master the basics soon and move to developing in node.js and Vue.js sooner than later. Also, if you are going to keep working with the very bare bones, at least consider working with Bootstrap classes. Here is what I learnt today location.replace, what is does is; when someone hits a button, we could re-direct our current page to any other URL/site/page. Codes are as follows for it. Explanation: Explanation would be simple, a function named myfunction is being called when someone hits button, in function(which is in JS file) location.replace is responsible for redirecting page to newly mentioned page/address. Still have 1 more hour energy in me, could try to post some more(may be Ajax call sample example). NOTE: This thread is for learning; since I am newbie in JS and not learning from book(which I mentioned in very first post too), this is not a sequential kind of learning, it is only references which someone could take it. Once I get good hands on I may post small projects etc then on forums. Last edited by RavinderSingh13; 5 Days Ago at 01:06 PM..